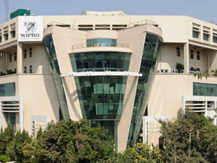 The Wipro Campus is an exemplary energy efficient building. 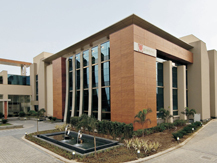 Notable features include - a reduced overall conductance for the envelops, terrace gardens, high performance grass with optimum visual light transmittance, exterior light shelves and over hangs for all windows, efficient chillers, efficient lighting using lamps and ample daylight spaces with photo sensor controls. Indian Haveli Plan'. The basic design concept is that of simple straight line, low-key architecture in context with the surroundings, site and climate. Passive (architectural) and active (mechanical/ electrical) strategies have been optimally designed to minimize energy consumption. 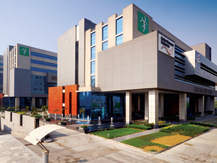 Green Boulevard is the World's Largest Platinum rated LEED certified Green Building from USGBC (United States Green Building Council) in Shell & Core Category . The Building is a multi-tenant project that is based around the concept of creating a congenial campus like environment, where every tenant can share common areas, facilities and still retain their privacy. Strategically located in sector 62- Noida, the towers are designed around shaded landscape courts with water bodies & plants, which helps to reduce the ambient temperature. The building depth has been optimized to capture daylight and to maximize views. The stilted public realms on the lower floors consist of an amphitheatre, a gym, a cafeteria and shops, helping to form an area of common interests.